Ram's new midsize pickup will be a body-on-frame truck built in the same plant in Toledo, Ohio, as Jeep's upcoming Wrangler-based pickup. The revelation means the Ram pickup, which will compete against the Chevrolet Colorado and upcoming Ford Ranger, will not be a Fiat-based unibody compact, such as the Ram 750 sold in Latin America. Mike Manley, Fiat Chrysler Automobiles' head of Jeep and Ram, promised the Ram pickup at the automaker's June 1 presentation in Balocco, Italy. But he provided few details about the truck, which is expected to arrive in U.S. dealerships in 2020 as a 2021 model. Manley is now CEO of FCA. Production of Ram's last midsize pickup, the Dakota, ended in 2011 after a 25-year run. Roughly half of FCA's sprawling Toledo Assembly Complex has been shut for retooling since late April, when the last JK Wranglers were built there. FCA is scheduled to begin recalling workers there next month. The line regularly built more than 230,000 JK Wranglers per year, well more than its planned capacity of 160,000. But the new Jeep pickup is not expected to sell in those volumes, leaving FCA with an underused plant unless it adds another body-on-frame product. AUBURN HILLS, Mich. - Fiat Chrysler Automobiles NV’s new CEO is tired of being No. 3 in U.S. pickup truck sales. So Chief Executive Mike Manley is now reconsidering a decision announced in January to stop building Ram heavy-duty pickups at a plant in Saltillo, Mexico. That plant, and another in Warren, Michigan, between them would produce other Ram models and free up manufacturing capacity to make even more new trucks to eat into sales of Ford Motor Co’s F-Series or General Motors Co’s Chevrolet Silverado, and its higher-end GMC Sierra. “With a combination of Warren and Mexico building what we call the classic truck, we have enough production to increase output next year if it’s required,” Manley said. “In my opinion it will be required. We are gaining share. Obviously I am looking for that to continue, but it’s an incredibly competitive segment,” he added. The Ram and Jeep brands underpin the automaker’s North American business - which accounted for nearly 85 percent of Fiat Chrysler’s second-quarter pre-tax profit - and offset the struggles of its legacy Fiat business in Europe and operations in China. So far, the gamble appears to be paying off. The new Ram 1500’s average sale price for the year to date through late October hit $46,856, - higher than the $42,389 average for the Ford F-150, according to industry data. Phil Jansen, Fiat Chrysler’s head of product development, said when his team began redesigning the Ram 1500, they decided a lighter, all-aluminum body - which Ford uses for its trucks - was too expensive. GM executives reached the same conclusion. Fiat Chrysler Automobiles outearned Ford Motor Co. in the third quarter, and it fulfilled a prediction from two years ago by then-CEO Sergio Marchionne by posting a record double-digit profit margin in North America. FCA's global adjusted earnings before interest and taxes rose 13 percent to $2.27 billion, the company said Tuesday. Global revenue rose 9 percent to $32.7 billion, and the company confirmed its operating guidance for the full year. However, the company reduced its forecast for net cash to a range of $1.7 billion to $2.27 billion, from an earlier projection of about $3.4 billion. The company’s global regions generated mixed results. FCA’s North American profit margin surged to 10.2 percent, the highest level since Fiat S.p.A. took control of bankrupt Chrysler in 2009. That's also more than double the 4.1 percent North American margin in the third quarter of 2014, when FCA began its five-year business plan that will end with the new year. Ford earned $1.7 billion before interest and taxes last quarter, down 27 percent, with a North American profit margin of 8.8 percent. General Motors reports its earnings Wednesday; its second-quarter North American margin was 9.4 percent. FCA's profit margins also surged in Latin America to 4.2 percent, up from 2.8 percent a year earlier. Like other automakers, FCA’s operations in the region had previously been hampered by political instability in Brazil and other South American countries. However, the company suffered losses in the Eastern Hemisphere, posting a 93 million euro loss ($106 million) in Asia Pacific because of a dramatic slowdown in China, and a $28 million loss in its Europe/Middle East/Africa region, because of slow Fiat sales and costs related to a new emissions testing regimen. The automaker promised to pay $2.27 billion in extraordinary dividends using proceeds from the sale of its Magneti Marelli parts unit. FCA last week agreed to sell Magneti Marelli to Japan’s Calsonic Kansei for $7.1 billion. FCA also said it plans to issue regular dividends to its investors of 20 percent of its profits starting next spring. FCA said it booked $810.9 million as a charge to pay for “U.S. diesel emission matters.” The company has been locked in litigation with federal regulators over emissions software used in about 101,000 2014-16 Ram 1500 and Jeep Grand Cherokee vehicles equipped with EcoDiesel engines. Settlement talks between the automaker and regulators are ongoing, and the matter remains unresolved, but FCA said the charge-off “represents an estimate of the provisions under applicable accounting guidelines based on progress of settlement discussions with counterparties.” The charge is intended to reflect an estimate of all known costs tied to the issue, a spokesman said. FCA slipped back into a net-debt position in the quarter, just three months after being able to boast that it finally had more cash on hand than debt on its books for the first time since the Chrysler takeover. FCA said it ended the quarter with $215 million more debt than cash on hand, compared with a $519 million net-cash position at the end of June. The backslide resulted from an accelerated discretionary U.S. pension payment of $682 million. FCA achieved its record North American margin in large part because of strong sales from Jeep and Ram, including the redesigned Jeep Wrangler and Ram 1500 and the freshened Jeep Cherokee. Marchionne told analysts in October 2016 that FCA would “be able to achieve double-digit margins" in North America once those products came online. And in the late CEO’s last quarterly conference call in April of this year prior to his July 25 death, the ailing Marchionne predicted FCA’s profit margins in North America would soon best rivals Ford and GM. “If it doesn’t happen on my watch in ’18, I don’t have a single doubt that my successor will be able to whack the crap out of both of them. The machine is ready to do it. Just let them engage,” Marchionne said then. Marchionne’s successor as FCA’s CEO, Mike Manley, was scheduled to speak to analysts and journalists on a conference call at 11 a.m. Eastern time Tuesday. Some 2,200 years after Hannibal crossed the Alps to invade Italy using an army of African war elephants, Fiat Chrysler Automobiles' Mopar brand is unleashing the Hellephant -- a giant, supercharged 1,000-hp crate engine it intends to sell next year and is capable of generating 950 pound-feet of torque. The anniversary may be accidental, but the power is not. The Hellephant represents a 41 percent power boost over the 707-hp Hellcrate 6.2-liter supercharged V-8 crate engine Mopar introduced just a year ago. The brand's latest behemoth-in-a-box harks back to Mopar's 426 Hemi engine, which debuted in 1964 and was known as the Elephant engine because of its size and power. The Elephant racing engine boasted about half the power and torque ratings of the crate engine Mopar revealed Tuesday at the 2018 SEMA show in Las Vegas. 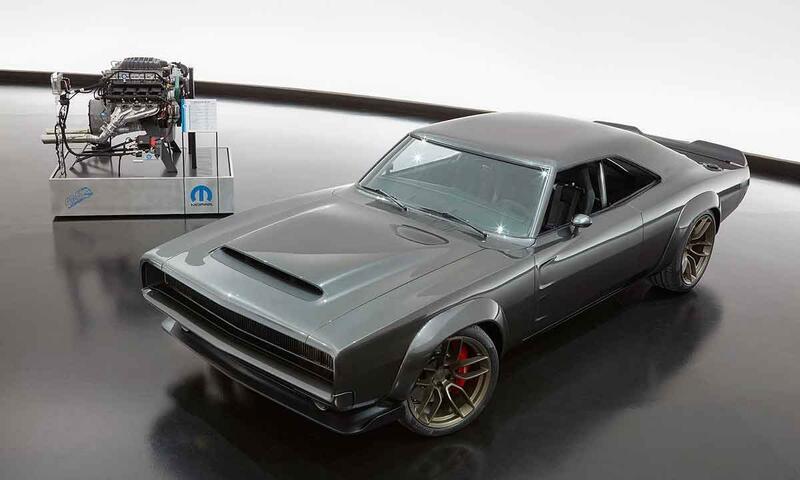 Mopar says the supercharged Hellephant and related installation kits are intended for enthusiasts for use in pre-1976 vehicles, and showed a concept 1968 Dodge Charger upfitted with the Hellephant and other accessories that it called the Super Charger. "Our enthusiasts crave power and performance and our new 'Hellephant' Mopar Crate HEMI engine and kit deliver huge horsepower and torque in a plug-and-play package that is unique in the industry," Steve Beahm, head of Mopar and passenger car brands for FCA US, said in a statement. "The 1968 Dodge Charger is one of the hottest classic cars, which is why we decided to use it as a starting point for the 'Super Charger' Concept. It's an amazing vehicle and a great showcase for our 'Hellephant' engine." The Hellephant engine uses enhanced displacement to achieve its four-figure power levels, with 4.0 inches of stroke and bore specs at 4.125 inches. Mopar says an improved supercharger with a high-efficiency rotor is mounted to the lighter weight, all-aluminum block. The block was also used in the Mopar Dodge Challenger Drag Pak race vehicles that achieved drag racing success this year. The Hellephant's demonic pachyderm logo is a callout to both the Muscle Car-era Elephant 426 HEMI and FCA's more recent success with the Hellcat and Demon performance cars. The complete engine assembly, which Mopar says is relatively plug-and-play for experienced installers, includes a water pump, flywheel, front sump oil pan, supercharger with throttle body, fuel injectors and coil packs. The available engine kit includes a powertrain control module, power distribution center, engine wiring harness, chassis harness, accelerator pedal, ground jumper, oxygen sensors, charge air temperature sensors, fuel pump control module and cam bus interface device. The powertrain control module is unlocked and tuned to pump out 1,000 hp and 950 pound-feet of torque. FCA's parts and service brand will also offer what it calls an essential Front End Accessory Drive Kit, including an alternator, power-steering pump, belts, pulleys and other items to ease installation. Pricing was not released. FCA said the Hellephant 426 HEMI crate engine and kit is expected to be available in the first quarter of 2019. Easily! So a chip set and re flach the controller probaly pick up another two to three hundred horses. Like the modern Charger body it's in. That I like too. I’d guess north of that. The Chevy ls7 427 that is supercharged i believe was in the $30k range. I looked into a Lingenfelter Super Charged LS9 750 h.p. for my 55 , only $36,099 GM Performance Super Charged LS9 638 h.p. is only $26,998, GM Performance Super Charged LT 5 755 h.p. is only $39,200. I wouldn't mind the Hellephant in my 55, 1000 h.p. in a 2405 lb car would be nice. Just would need my mrs guardian angel with me. Nobody noticed the retro Charger in the front of the photo? The diesel pickup torque tug-of-war being waged among Detroit's truck brands lurches into 2019 with a change at the top of the leaderboard: The re-engineered 2019 Ram heavy-duty 3500 pickup arriving soon at dealerships sports the industry's first engine to crank out 1,000 pound-feet of torque. That torque figure is not a PR and marketing gimmick — although the figure will no doubt feature prominently in ads. It's an important measurement buyers who tow and haul heavy loads consider when they shop for heavy-duty pickups. The 1,000 pound-feet rating is a 70 unit bump over the outgoing 2018 truck's top torque. Ram, which has used a Cummins-built inline six in its heavy-duty trucks for 30 years, edges out Ford's 6.7-liter Powerstroke diesel V-8, which has a torque rating of 935 pound-feet. The 6.6-liter Duramax diesel V-8 in the redesigned heavy-duty Chevrolet Silverado and GMC Sierra pickups coming midyear is rated at 910 pound-feet of torque. When it comes to horsepower — which is more closely related to a vehicle's top speed, not its hauling capability — both the Ford and GM diesel heavy-duty V-8 truck engines outhustle the Ram's inline-six. Ford's Powerstroke heavy-duty diesel is rated at 450 hp and GM's Duramax is 445 hp. Ram is rated at 400 hp. 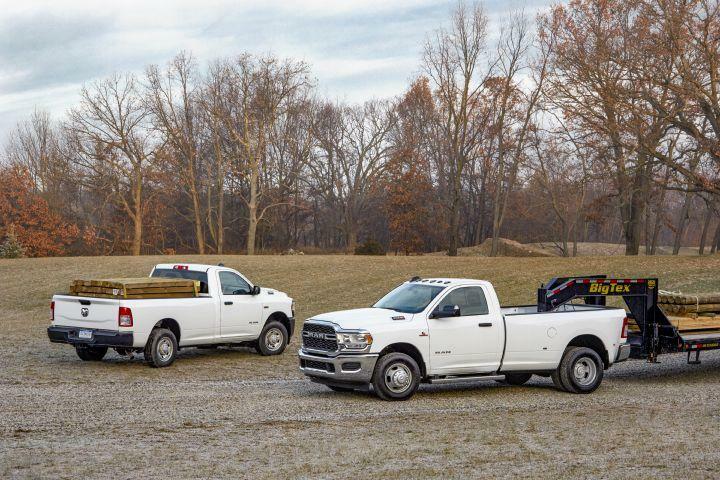 Ram's lead in torque and maximum towing may be short-lived. Ford plans to launch a redesigned Super Duty pickup second half of this year. The truck is essentially new from the ground up, built on a new frame that makes extensive use of high-strength steel—98.5 percent, according to Ram—for improved strength and weight savings, with six crossmembers and fully boxed rear sections. A pair of Active-Tuned Mass Modules similar to those used on the 2019 Ram 1500 help dampen vibration. Suspension upgrades include new, stronger and lighter front and rear axles, plus progressive springs and upgraded bushings. The 3500 one-ton has rear leaf springs, while the 2500 three-quarter-ton retains the coil-spring setup. Rear air springs are available, with the 2500 setup replacing the traditional springs with a pair of air springs. The 3500 supplements the leaf springs with air bags, allowing the engineers to spec a smoother-riding leaf spring when the truck is unladen. Three modes of operation control the air springs: Normal/Payload automatically detects the load and adjusts the springs accordingly, Trailer Mode allows the bed to lower about an inch to maintain a level relationship with the trailer, and Bed Mode permits lowering of the bed to simplify trailer hookup or ease loading. Riding atop that frame is a freshly restyled body that features an increased amount of high-strength steel, which, combined with an aluminum hood and other weight-saving measures, contributes to a claimed 143-pound overall weight reduction. Engineers strived for a sleeker profile and managed to come out of the wind tunnel with a 0.41 drag coefficient, the lowest ever for a Ram HD. The bodywork is exclusive, too, sharing no panels with the recently refreshed Ram 1500. Combined with new engine mounts, hydraulic body mounts at the C-pillars, active noise cancellation, new exhaust components, and the aforementioned vibration dampeners, Ram says it has lowered the ambient interior sound level by 10 decibels, a claim we will gladly confirm when we test one. Extensive revisions were also made to the electrical system, including two available dual alternator setups to make sure all the latest tech features, instrumentation, and accessories function properly and to ensure plenty of power and junction points for upfitters who reconfigure the Ram chassis for commercial and emergency-vehicle use. 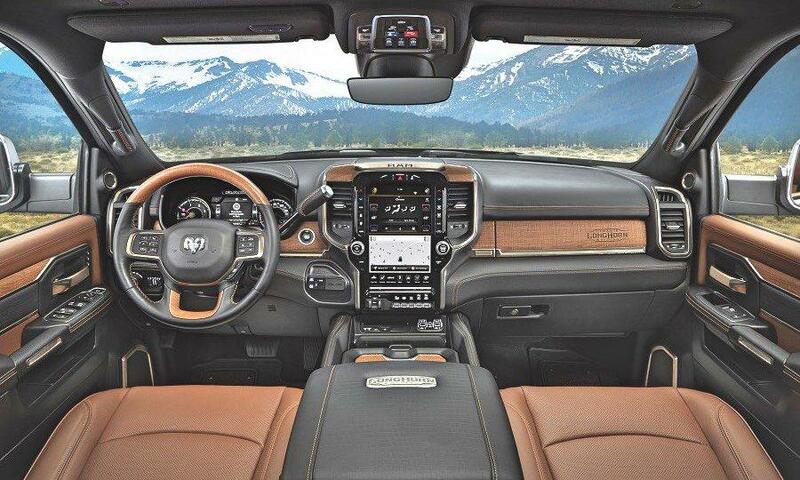 The interior continues the brand-wide uptick in quality and refinement started by the recently redesigned Ram 1500, emphasizing a new instrument panel, upscale materials, and a revised HVAC system that moves a higher volume of air while simultaneously reducing noise. Electric heating elements on diesel models speed up the delivery of warm air on cold mornings. The redesigned center console provides enough storage area to put a 15.0-inch laptop out of sight and offers three USB ports in front and two in back for a total of five; three of them, including one in back, communicate with the Uconnect infotainment system. A 5.0-inch screen is standard; an 8.4-incher is optional, as is a fully configurable 12.0-inch screen with unique graphics keyed to individual Ram models. Looking deeper into the powertrain, the lineup starts with a naturally aspirated Hemi 6.4-liter V-8. (The previous base engine, the 5.7-liter Hemi, has been removed from the lineup.) Rated at 410 horsepower and 429 lb-ft of torque, the 6.4 sends its output to the maker's 8HP75 eight-speed automatic transmission made by ZF. Beefed up for HD duty with additional planet gears for two of the gearsets, a reinforced torque converter, and a heavy-duty parking pawl, it uses sixth gear as direct drive and seventh and eighth as overdrives. Interestingly, the Ram HD's maximum payload figure of 7680 pounds is earned by a regular-cab long-box 3500 dually model equipped with the 6.4 gasoline Hemi V-8. It's not that the diesel couldn't handle the load, but the gasoline engine's lighter weight contributes less to the gross vehicle weight rating. Shifting duties for the standard-output 6.7-liter diesel fall to an upgraded version of the six-speed automatic transmission used previously. Shift quality is said to be improved by the use of variable-force solenoid controls for the torque-convertor clutch, and a new reverse accumulator improves shift feel when going from park to reverse. Additional hydraulic elements were tweaked to smooth the shift from drive to park. Buyers opting for the high-output diesel get an Aisin six-speed automatic transmission with a larger thrust bearing and additional heat treating for specific components. Choosing four-wheel drive brings a trio of transfer-case options. The 6.4-liter Hemi gasoline V-8 and standard-output 6.7-liter diesel powertrains utilize a BorgWarner transfer case with either a manual (BW-44-47) or electric (BW 44-46) shift. The low-range ratio is a 2.64:1 reduction. Harnessing the mountain of torque from the high-output Cummins requires the talents of the new and hefty BorgWarner part-time transfer case (BW 44-48) that is designed to withstand the 3500's tow rating of 35,100 pounds when equipped with the Max Tow package (trailer-brake controller, cargo-view camera, fifth-wheel hitch, 12-inch rear axle with a 4.10:1 ratio gear set, larger bearings, dual rear wheels, and a few additional items). Ram says the braking system has been upgraded with a new brake booster and master cylinder. We'll have to take Ram's word for it for now, but we can tell the front rotors measure 14.7 inches and the rears 14.1 inches and both are pinched two-piston calipers. Either way, Ram points that braking on the diesel models is aided by an integrated exhaust brake. As usual, Ram will offer its HD pickup in Power Wagon form. Based on the 2500 4x4 Crew Cab, it brings a distinct suspension with factory lift, locking front and rear differentials with 4.10:1 gears, a disconnecting anti-roll bar, and a Warn winch with a kink-resistant synthetic cable that weighs in at 28 pounds less than a comparable steel cable. It's also still possible to order the Power Wagon content on the base Tradesman model while retaining the Tradesman design elements. Six trim levels fill out the 2019 HD lineup: Tradesman, Big Horn (rebranded as Lone Star in Texas), Power Wagon, Laramie, Laramie Longhorn, and Limited. In addition to the usual smorgasbord of tech, luxury, and utility options available a la carte, buyers can select from numerous body configurations including a regular cab with a 169.1-inch wheelbase and an 8.0-foot box, a crew cab available in either a 149.1-inch wheelbase with a 6.4-foot box or a 169.1 wheelbase with an 8.0-foot box, and Mega Cab models with a 160.2-inch wheelbase with a 6.4-foot box. There are 12 exterior colors offered, including three new ones: Billet Silver, Patriot Blue, and Diamond Black. Six new eight-lug wheel designs ranging from 17 to 20 inches are also on tap. The heavy-duty truck segment lives and dies by the numbers, and when you're talking diesels it's torque that gets the headlines. No matter that most casual owners will never come close to exploiting the maximum capability of the 1000-lb-ft beast, this is Ram's time in the spotlight. No doubt Ford and Chevrolet are already plotting strategies to knock it off its perch. Ram Commercial has boosted performance and capability of its 2019 Ram Heavy Duty (2500 and 3500) pickup trucks with a new, high-output 6.7-liter Cummins inline-six-cylinder engine with the most power of any light-duty pickup on the market. The trucks, which were unveiled at the Detroit auto show, also add more technology and interior upgrades, including the 12-inch landscape touchscreen found in the 2019 Ram 1500. The newly updated pickups will go on sale by July 1, according to Dave Elshoff, a Ram spokesman. The Ram 2500 and 3500 pickups are powered by three engines, including a pair of updated 6.7-liter inline-six cylinder Cummins turbo diesels and standard 6.4-liter Hemi V-8. A high-output 6.7-liter Cummins that tops the engine lineup produces up to 400 horsepower and 1,000 lb.-ft. of torque. Ram engineers were able to achieve a significant boost in horsepower and torque, while reducing overall engine weight by 60 pounds. The second 6.7-liter Cummins turbo diesel produces 370 hp and 850 ft.lb. of torque. The Ram HD's base V-8 gasoline engine power has been increased to 410 hp and 429 lb.-ft. of torque. The engines will deliver their power via three transmissions. Ram is pairing its high-output diesel with the Aisin AS69RC six-speed automatic that improves shift quality. The standard 6.7-liter diesel will deliver power through an upgraded Ram 68RFE six-speed automatic transmission. Ram is pairing its Hemi V-8 with a new TorqueFlite 8HP75 eight-speed automatic transmission. The increased power has boosted the hauling capabilities of the Ram HD trucks to a maximum of 7,680 pounds of payload and 35,100 pounds of tow weight. To achieve these weights, the truck would need to be equipped with the high-output 6.7-liter diesel engine. 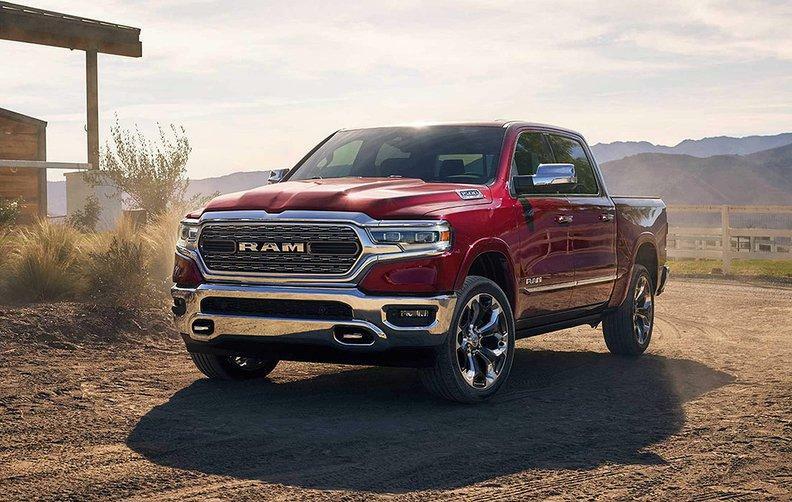 In addition to the added power, Ram has reduced overall weight by up to 143 pounds by incorporating lighter-weight materials in the frame, powertrain, and with an aluminum hood. 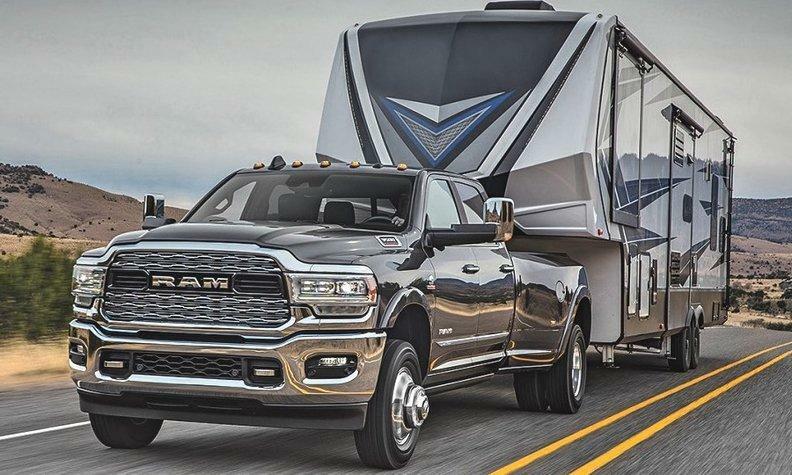 Ram is adding a third cab, called a Mega Cab, alongside the regular and crew cab models that will offer 258 liters of interior storage capacity. Technology upgrades include a new 360-degree surround-view camera with a trailer reverse guidance view and an advanced trailer tire pressure monitoring system that accomodates up to six pickup tires (for dual rear-wheel models), 12 trailer tires, and four towing profiles. The fully redesigned interior adds the Uconnect 4C navigation system with a 12-inch screen. The trucks add more than 100 available safety features such as automatic emergency braking, a cargo-view camera, and Ram 3500 back-up sensors with wider coverage for dual-rear-wheel trucks. Ram will also offer an updated 2019 Power Wagon based on the 2500 pickup with new content such as a 360-degree camera, front-mounted WARN Zeon-12 winch, and a Power Wagon package for the Tradesman model. The trucks will be built at the Saltillo Truck Assembly Plant in Coahuila, Mexico. Cummins Inc. unveiled its next generation 6.7L turbo diesel engine boasting a first-in-class 1,000 pound-feet of torque. From the introduction of Cummins 5.9L Turbo Diesel powered RAM trucks in 1989, to the latest 6.7L turbo diesel, Cummins has worked with RAM to provide drivers the toughest, most reliable engines on the road. The Cummins under the hood of the new 2019 RAM HD pickup is a real showstopper in the RAM Trucks booth at the North American International Auto Show in Detroit, Michigan. This next-generation 6.7L Turbo Diesel provides the power for RAM HD pickups to deliver increased payload and towing while engineered to maintain Cummins proven reliability and dependability. The Cummins 6.7L turbo diesel is offered in two variants; standard output 370 horsepower (850 pound-feet of torque) and high output 400 horsepower (record setting 1,000 pound-feet of torque). The high-output (HO) rating is offered exclusively in the RAM 3500 equipped with the Aisin transmission option. The standard-output (SO) at 370 horsepower and 850 pound-feet of torque when matched with the 68RFE transmission option. “The Cummins name has been synonymous with technological innovation and reliability since 1919,” said Melina Kennedy, General Manager – Cummins Pickup segment. “In addition to celebrating 100 years of diesel engine production, we are also celebrating 30 years of powering RAM trucks,” stated Srikanth Padmanabhan, Vice President - Cummins Engine Business. “Together, RAM and Cummins have accomplished many milestones and technological advances. From the time the first prototype truck was put together in the 1980s to now, breaking the 1,000 pound-feet barrier together, exemplifies the strength of our partnership." In the last 30 years, Cummins has produced almost 3 million turbo diesel engines installed in RAM trucks, earning the respect of truck customers everywhere. The blocks are machined and engines are assembled just outside of Cummins’ global headquarters in Columbus, Indiana. Base engine improvements made to support the new higher output ratings of the next-generation 6.7L engine include a compacted graphite iron engine block that increases peak cylinder pressure capability, a new cast-iron cylinder head containing high-temperature capable exhaust valves actuated by all-new hydraulic lash adjusters in the block eliminating the need for valvetrain adjustment service intervals. The heart of the engine is a higher strength alloy crankshaft with a 10-bolt crank flange driving newly-designed forged connecting rods and new bearings which transfer power from the low-friction ring wrapped pistons. I don't think I'm complaining (then again, maybe I am), but pickups are getting ridiculous. But I love the ridiculousness because it allows me to justify the idea of taking an old b and transplanting it onto a pickup truck instead of finding another Mack chassis for it. That’s a project for the future but I still love the idea of it still being able to haul a ton with it. The recall announced Friday involves about 178,829 vehicles in North America, including 159,740 in the U.S. A fastener that grounds the battery wasn't properly secured in 2019 Ram 1500 pickups. As a result, the connection can become loose and disable the powering steering. Drivers can still steer, but the unstable feedback may increase the risk of a crash. FCA said there have been no reports of crashes or injuries. The automaker did not state a date for the recall to begin, but under U.S. law, it has to start within 60 days. The Ram 1500 won North American Truck of the Year at the Detroit auto show this month, an annual competition that judges redesigned or significantly changed vehicles on innovation, design, safety, performance, technology, value and driver satisfaction. Even though the Chevrolet Silverado 1500, GMC Sierra 1500 and Ram were all redesigned, media reviews praised the Ram for its interior. FCA US said December sales rose 14 percent, driven in part by a 34 percent increase in Ram pickup sales. For the year, Ram pickup sales gained 7.2 percent to 536,980 deliveries. DETROIT — Luxury in the heavy-duty truck market is no longer just a seat belt. The upscaling of heavy-duty interiors has been gradual, with some pointing to Ford's first Super Duty King Ranch entry and its leather-laced cabin in the early 2000s as a turning point for the powerful hauling class. Now Ram is looking to raise the luxury bar again in what has traditionally been seen as the rugged workingman's segment. Ram believes the ample leather and wood and the 12-inch touch screen option that it added to the overhauled interiors of its upcoming 2019 heavy-duty lineup will be a welcome touch of refinement to buyers who want more than a work truck. 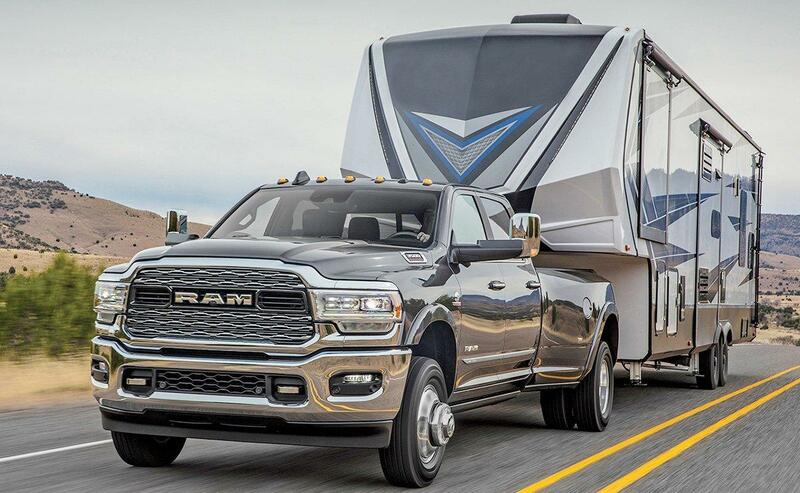 These are the consumers who are towing luxury items worth much more than the trucks themselves, including huge campers or horse trailers, said Reid Bigland, head of the Ram brand. Bigland said Ram has "fundamentally lifted" the award-winning interior from the smaller 1500 and transplanted it into its strongest haulers. Still, Ram didn't forget about the segment's work-driven calling card. Bigland said during a December briefing that Ram realizes heavy-duty trucks can't get by on looks and creature comforts alone. The brand also made sure to up the performance ante, which is highlighted by the 1,000 pound-feet of torque generated by the Ram 3500's new 6.7-liter Cummins turbodiesel engine, a milestone for the segment. Together, the technology, powertrain, design and luxury improvements to the light- and heavy-duty trucks represent Ram's effort to shake up a full-size pickup market that's driven heavily by brand loyalty. Ram, a perennial No. 3 among the Detroit automakers, sees a chance to close the gap with General Motors' Chevrolet Silverado and GMC Sierra, which combine for second place, while Ford's No. 1 F series gallops ahead. "We think we're really raising the bar across the board," Bigland said on the sidelines of the Detroit auto show. "When you look at the technology, the 12-inch touch screen, the level of refinement on the interior, the level of luxury coupled with that capability. We think we have all of the bases covered. We'd like to think we're in a league of our own." Ram packed its beasts with the latest infotainment gadgets, including Apple CarPlay and Android Auto along with an available Harman Kardon audio system with 17 speakers. The brand also rolled out a 360-degree camera system that provides a simulated bird's-eye view. Ram says a reverse guidance camera view shows both sides of a trailer to help drivers with towing maneuvers. "Ram has done an amazing job at building capable, comfortable trucks that also can have a certain level of luxury," said Brian Moody, executive editor of Autotrader. "If GMC is not careful, Ram may end up taking their spot as a luxury truck." The infusion of more high-end materials and technology is a response to the changing needs of heavy-duty customers who have grown accustomed to these things in other vehicles, says Stephanie Brinley, principal automotive analyst at IHS Markit. She believes some of the buyers of the loaded trims may turn out to be company bosses who don't haul as much they used to, but still drive them to work sites. "Offering the better interior materials and more technology to the heavy-duty buyer simply reflects the fact that people expect more from their interiors than they used to," Brinley said. "And the heavy-duty buyer, even though he's using it as a work truck, they've gotten used to technology being in the cars, and they want it in their truck, too." Don Lee, a Ram dealer in Maine, said the added luxury brings more versatility to the heavy-duty lineup. "I can see a situation where a heavy-duty owner would step up and buy a more luxurious vehicle, a more comfortable vehicle, so he can continue to use his vehicle on his personal time as well as enjoy some of these additional features and luxuries during the workweek," said Lee, president of Lee Auto Malls. Competition will continue to be fierce. GMC just revealed the 2020 Sierra 2500HD and 3500HD, which will come with a versatile tailgate, large head-up display and advanced trailering system with an app, among other features. Its 6.6-liter Duramax diesel model falls short of Ram's 6.7-liter Cummins diesel at 910 pound-feet of torque. Duncan Aldred, vice president of GMC, told media ahead of the vehicle's unveiling last week that the Sierra HD is "the crown jewel" of the company's lineup. And the Chevrolet Silverado HD, expected to debut in February, will enter the segment with a redesign that differentiates it from the smaller 1500 and new trailering technology, the company said. Pickups are becoming more semi like and semis are becoming car like.